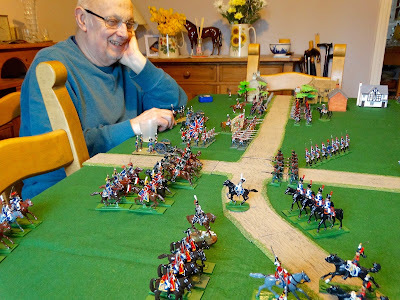 Mr Asquith has been a little under the weather of late, so it was with great pleasure that I attended his house a few days ago to recommence our regular games. 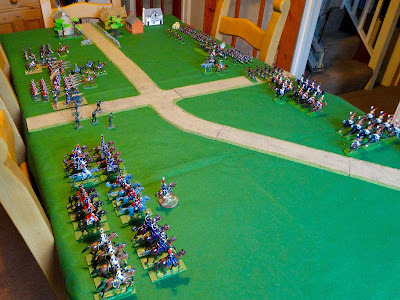 The occasion was celebrated in fine fashion with a game in one of the great wargaming periods, played using some classic figures. 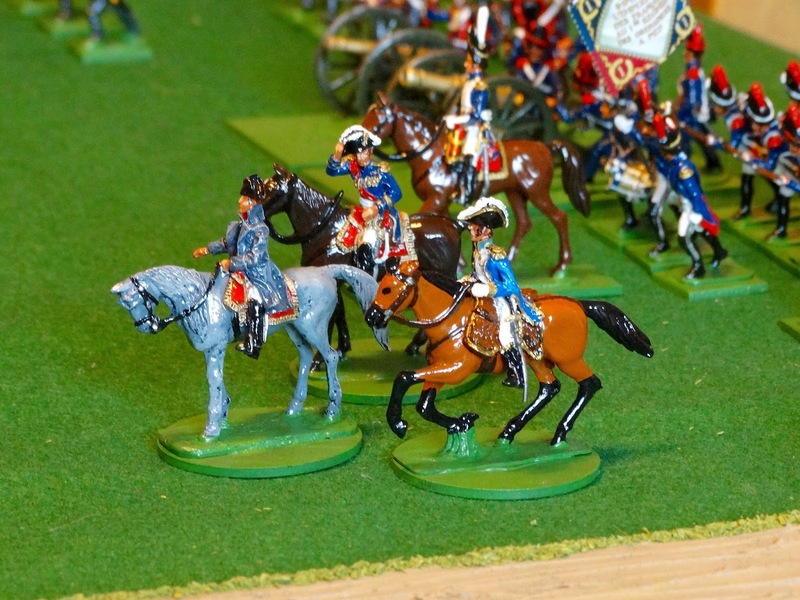 To wit, a Napoleonic game with 30mm figures from the Willie (Edward Suren) and Tradition (Charles Stadden) ranges, both still available from Tradition of London. 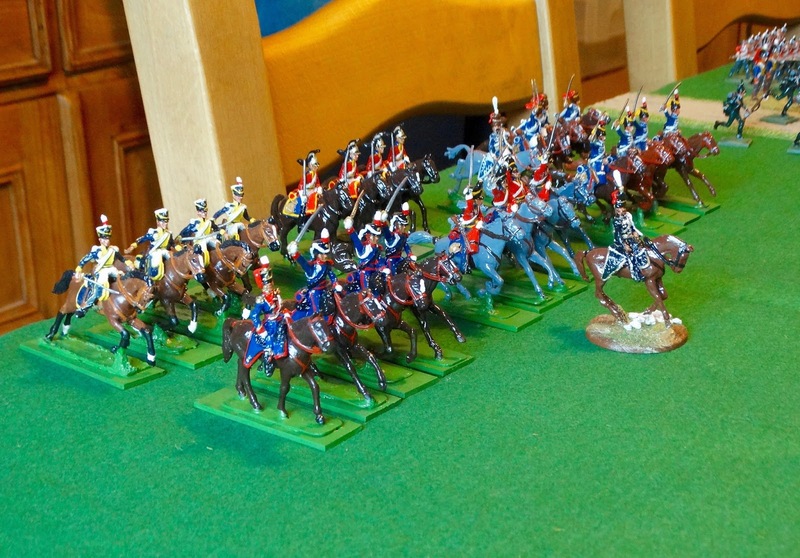 All the figures had been painted, and the units assembled, relatively recently by Stuart. 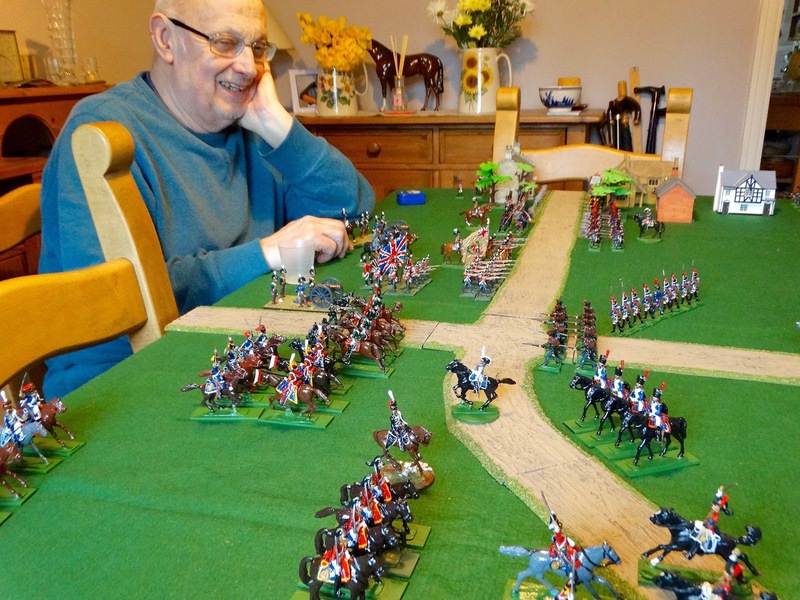 As so often, the game turned out to be an object lesson in how much pleasure can be wrung from a modest number of figures, simple rules and a dining table playing area. 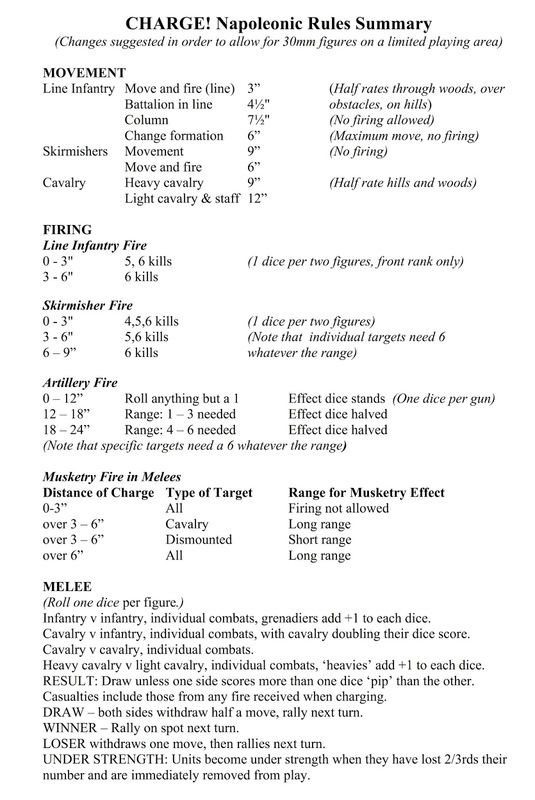 To illustrate this, we will begin with the orders of battle of the opposing armies. 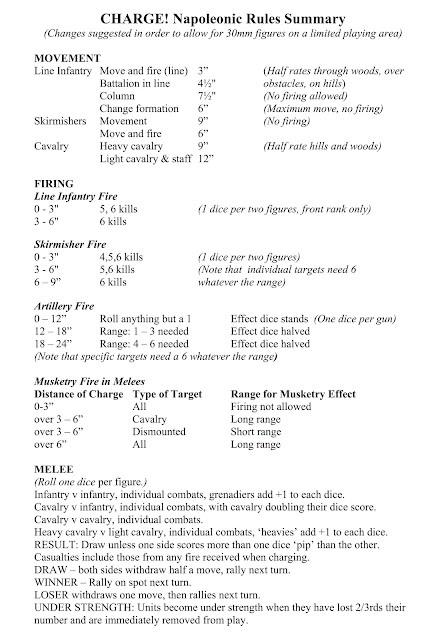 The figures in brackets are the number of models in each unit. It will be as well to start with some close ups of selected units on their start lines, just to give a flavour of the lovely figures in use. British cavalry, with the Light Brigade nearest. The British would suffer from their inferiority in heavy cavalry. The Emperor Napoleon and his suite. 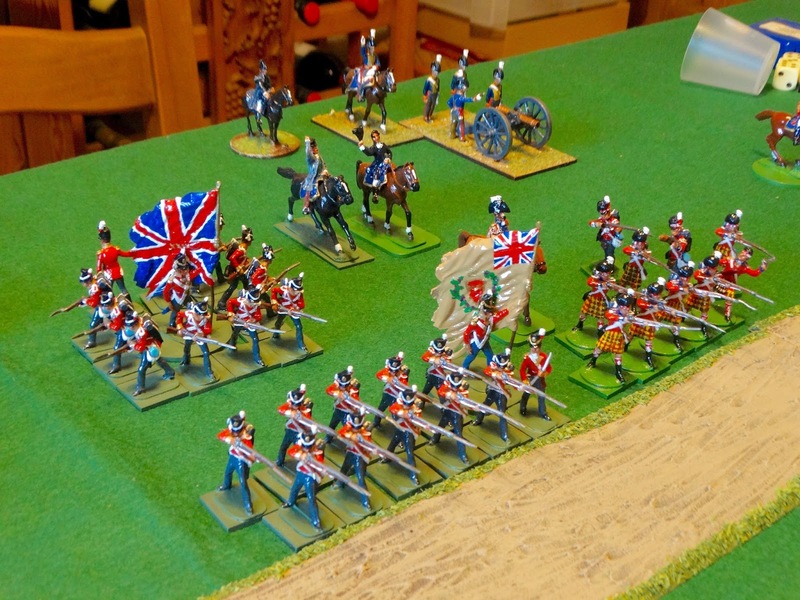 The 2 battalions of the Gloucesters with their magnificent colours. The British 1st Infantry Division, in all their glory, wait to move off. The inevitable cavalry melee commenced almost straight away. with light infantry covering their flank. A firefight commences across the main road. Both sides were initially reluctant to sound the charge. 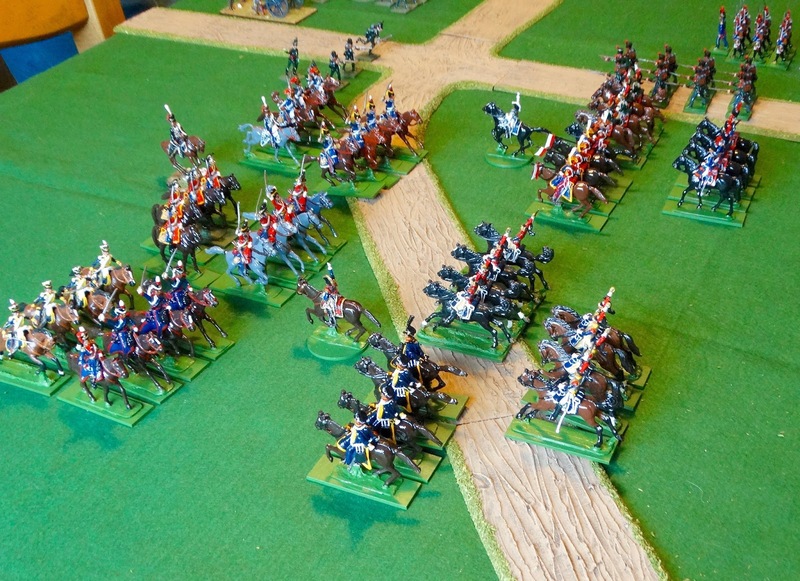 The French advantage in heavy cavalry soon told on the other flank. The crossroads is firmly in French hands. 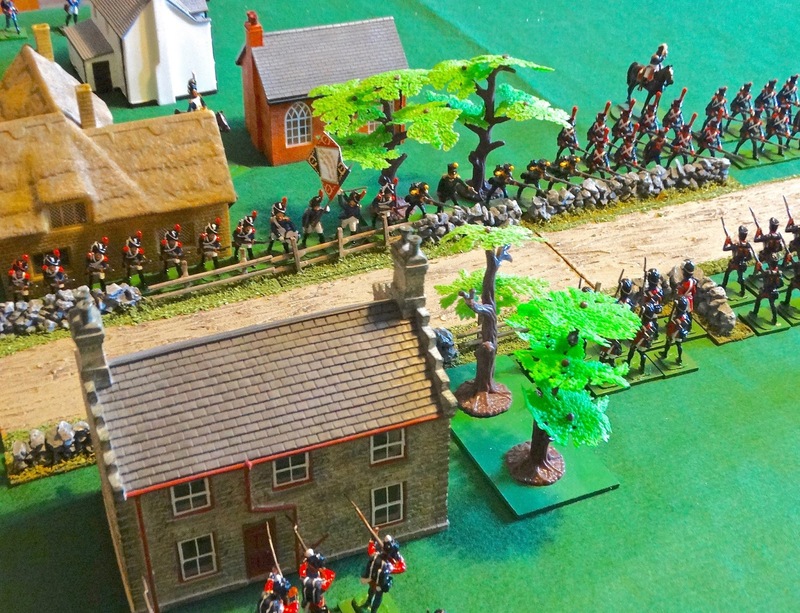 Deadlock between the French (far side) and British (near side) infantry. 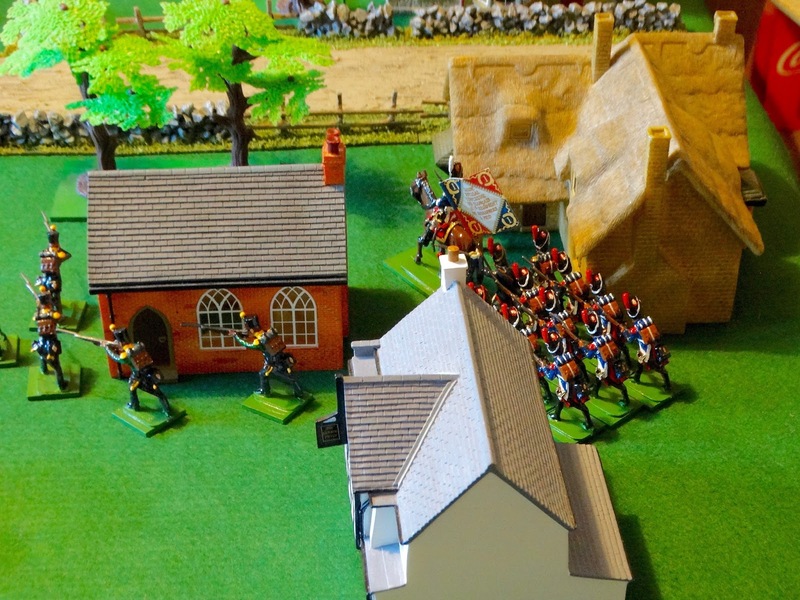 battalions of the Gloucesters into square. 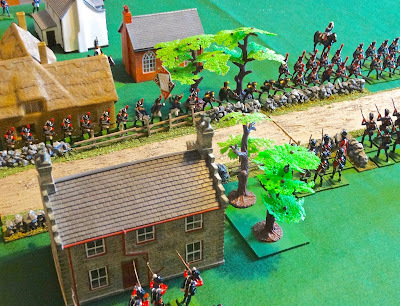 The 95th Rifles having been ridden over at the crossroads, Stuart conceded "to save needless slaughter". Or in other words, to avoid the spectacle of his army being rolled up by my cavalry! We concluded the afternoon by reviewing the ECW units Stuart has put together, using the same figure manufacturers as seen in this battle. The ECW is a period I have often considered playing, but have never ventured into. I look forward to trying this new venture in the future, once we have adopted some suitably simple rules! Talking of which, the rules used for this Napoleonic dust-up are given below. Oh and by the way, if you want to view the first 'Old School Napoleonics' post, check this link. See you next time. As a long time Charge! 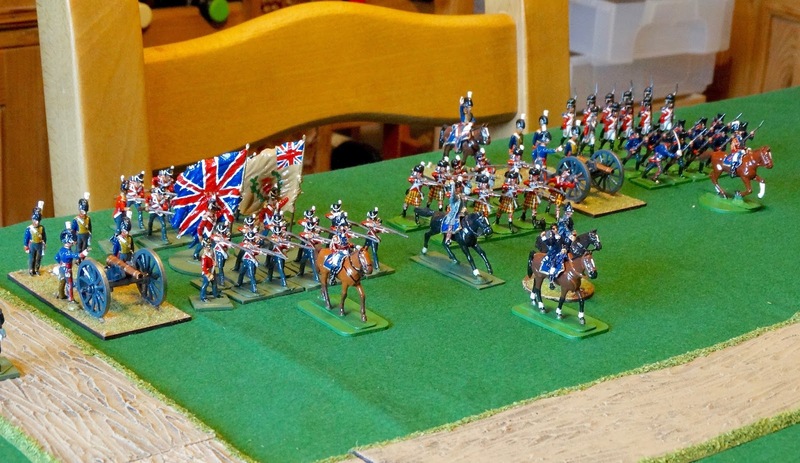 player who no longer has a large table and has failed to come up a good "small" version, I like Stuart's one and have snatched a copy to try it out! A delightful way to spend an evening. Lovely figures, good company and not having to spend all the time with nose in the rule book. Thanks for sharing. What lovely figures and set up.Thanks for sharing them with us all. 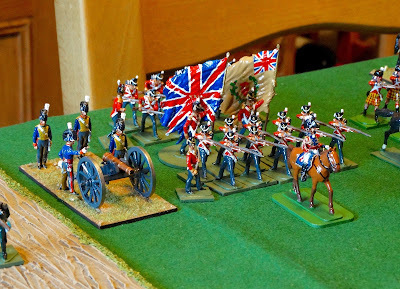 Small table Charge will work well with my 20mm Classic Napoleonics. I also no longer have a permanent wargame table. 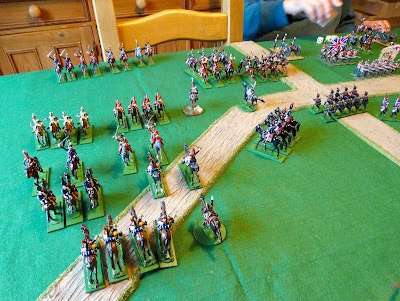 This reminds me very much of the Napoleonic games a group of us used to play about 40-odd years ago - Charge adapted for small units (9-figure infantry and 5-figure cavalry regiments). However, our rules adaptations were far less well thought out than what has been presented here! What a lovely looking game and nice to see you two chaps crossing swords again. Thanks everyone. 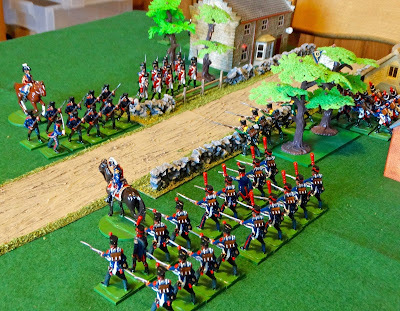 It's good to hear from wargamers who can still appreciate something a bit more (shall we say) 'traditional' than most gaming seen today..
Another fantastic looking game with beautiful figures. What happened to the Warrior figures though ? You are a lucky man - a charming game, and as you said previously, the joy of OSW is the company, not the equipment in use. Wish Mr Asquith well for me - he has been a remarkable inspiration to a whole host of war gamers. He may not have been invited to “the wedding”, but he is royalty to my generation of gamers. Marc, the Warrior figures are still safe and sound in their barracks! Stuart keeps an eye on this blog and so has probably already seen your very kind comments - but I'll make sure they are brought to his attention. Again, great looking old school figures. Great looking game!